Spring has sprung at the English Club! Well, Spring has sprung, as my dad used to say, bringing showers and flowers: light rain and primroses, snowdrops and bluebells. They push their way up through the hard ground to show us that, hopefully, winter is behind us and we too can start thinking about getting out of our houses. I know, I’m very poetic this month but I love the spring. 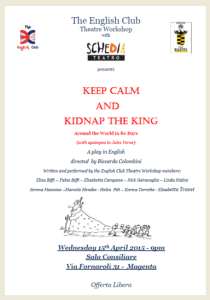 So how about getting out on Wednesday 15th April when the newly formed English Club Theatre Workshop will be putting on its first performance: Keep Calm and Kidnap the King. A play in English written (yes written!) by the group itself and wisely directed by Riccardo Colombini of Schedia Teatro. Starting from a few classic exercises to learn how to move on stage and interact with each other , the group then started discussing (in English!) possible stories to inspire the play to be performed. A lot of ideas came up and two main ideas were at the top of the list. We just couldn’t decide. I can still hear it now: his professional voice. So we got up and went and created this show! So it’s Wednesday 15th April 2015 at 9pm (ore 21:00 for Italians…) Nuova Sala Consiliare Via Fornaroli 31 – Magenta repeat NUOVA SALA CONSILIARE (near the library) NOT Casa Giacobbe as usual. 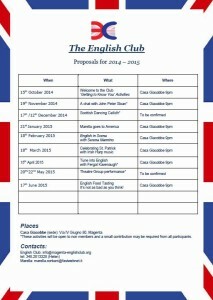 Next month will be dedicated to us – The English Club . Since we are an association we have certain ‘obligations’. For example – elections! So next month we will start by voting for our President and committee members. At the moment there are three members who are no longer involved so we need someone to replace them. It’s not a difficult task; above all we are looking for new ideas for next year. So if you are interested in getting involved in the organization drop us a line! It is little more than a formality but we must follow the rules! When all members present have voted we will go on to the real topic of the evening: 1859: In the meantime….. what was happening in the rest of the world? The members of the group will each present their special event or person from that period. The exhibition will be displayed in Casa Giacobbe and we are working with the Comune to fix a date for the official opening. towards the end of May. Stay tuned !! We are counting on our members to make this event a success so please don’t miss it!